While everybody expected USB-C connectors on the new MacBook Pro, all four ports being Thunderbolt 3 wasn't. AppleInsider explains the differences between USB-C, USB 3.1 gen 2, and Thunderbolt 3, and examines Apple's latest implementation of the technologies. The three terms associated with external device input and charging on the new MacBook Pro are being bandied about on the internet and social media, with a general lack of understanding. Couple that with a lack of user education, and you'd think that Apple omitting the USB type-A connector on the new machine is the end of the world, dooming all legacy peripherals to the trash heap, or similarly dramatic histrionics. In 2013, the USB Implementers Forum revealed the USB 3.1 connectivity specification, which doubled connection speeds of the older USB 3.0 to 10 gigabits per second with a new "SuperSpeed+" transfer mode and a slightly modified Type B peripheral connector. This hurts now, but like other adapter crises before it drawing the ire of users, will pass in time. Shortly after announcement of the USB 3.1 speed boost, the same group announced a new physical connector with the potential for a symmetrical single cable to provide power not just to peripherals, but host device power as well—USB-C. Confusing the matter somewhat, are early adoptions of USB 3.1. 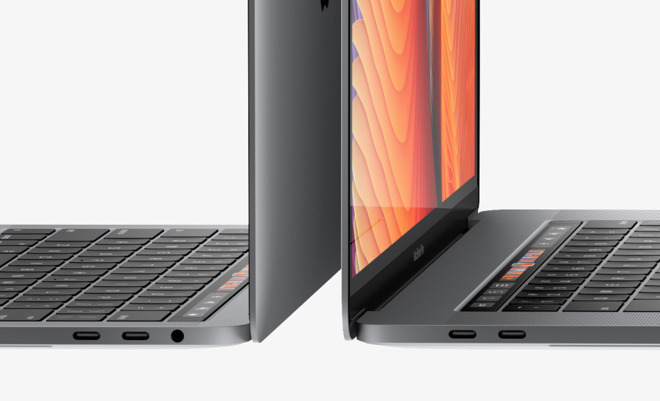 The first release, as seen on the MacBook from 2015 is USB 3.1 generation 1, limited to 5 megabits per second, but including some improvements from the USB 3.1 protocol, including the ability to use the USB-C physical connector. USB 3.1 and USB-C are not synonymous terms. Thunderbolt take a different approach to data transfer, and in many ways is more like Apple and Texas Instruments' legacy FireWire connector than USB. The latest version of Thunderbolt is capable of 40 gigabits per second of transfer speed, per Thunderbolt controller chip —more on this a bit later. In 2015, the The USB group, and the assortment of companies controlling Thunderbolt, unified behind one physical connector —the USB-C connector. The best way to think about it is to consider Thunderbolt 3 as the "master" cable, which contains the USB 3.1 generation 2 protocol for data transfer and power delivery, plus HDMI and DisplayPort 1.2 standards for support of 4K and 5K displays. Lower-end configurations of the new MacBook Pro have a pair of Thunderbolt 3 ports. Apple has noted that the dual-Thunderbolt model will support either a pair of 4K monitors or a single 5K monitor. Similarly, the four-port Thunderbolt 3 model can drive a pair of 5K monitors, or four 4K monitors. A single Thunderbolt 3 controller only has sufficient bandwidth for a single 5K monitor, so Apple has implemented a pair of Thunderbolt 3 controllers in this configuration for the feature —and just isn't trumpeting that fact. Most 4K monitors require a single DisplayPort cable for operation, and 5K monitors, generally need two —but the LG 5K display only has one cable. The single cable connecting the MacBook Pro to the LG 5K display at the "hello again" release event has generated confusion surrounding the connection. Speculation arose that the LG was using some custom protocol because of the single cable, and that the MacBook Pro would only be able to run certain 5K displays as a result —which is bogus. The answer is simpler. The connecting cable is Thunderbolt and is carrying a pair of DisplayPort signals, and not a DisplayPort cable. To use other (rare) 5K displays, both Thunderbolt 3 ports on a side will need to be used as DisplayPort connectors, the same as with the 2015 MacBook Pro. While Phil Schiller wisely avoided the use of "courage" to explain the shift to the USB-C port, the writing has been on the wall for some time that this is the way the industry is going. USB 3.1 generation 2 is twice as fast as USB 3.0. The physical connector associated with USB 3.1, USB-C, is symmetrical across the horizontal axis, so no cable end-flipping is necessary to plug in the connector. Thunderbolt 3 is twice as fast as Thunderbolt 2, and uses the same physical connector. Since the connectors are shared, and Thunderbolt 3 contains USB 3.1 generation 2, users can plug in a USB 3.1 Generation 2 Type-C connector and get the same connectivity as always. Plus, the faster speed allows for a single Thunderbolt 3 cable to extend to a dock or hub, and provide data and not have any problems with being bandwidth-starved on the tail-end of the chain. When USB hit the scene, the entire computer industry was wracked with adapters, and dongles, USB to ADB, USB to Parallel just to name two. That period of adapters being common is over, but computer users have always needed some level of specific cabling, cable adapters, or dongles to connect from point A to point B. This hurts now, but like other adapter crises before it drawing the ire of users, will pass in time. USB-C has begun its march with Apple not being the only flag-bearer, and will become the ubiquitous computer connector —until the next one, where we will do it all again, and again vent on whatever has replaced Facebook or Twitter as our venues of choice.